Volume 3 of an official sequel to Jim Henson’s cult classic fantasy film The Dark Crystal. After the arduous journey across the strange lands of Thra, Thurma has returned to her homeworld of Mithra. Just as when she began her journey she is alone, having betrayed her only ally. But as Thurma attempts to cast aside her guilt and affection for Kensho to complete her mission, the two are reunited. Kensho has not given up hope that their worlds might both be saved. If Thra and Mithra are to coexist, these unlikely heroes will have to reconcile their differences and uncover the secret that connects their two worlds. 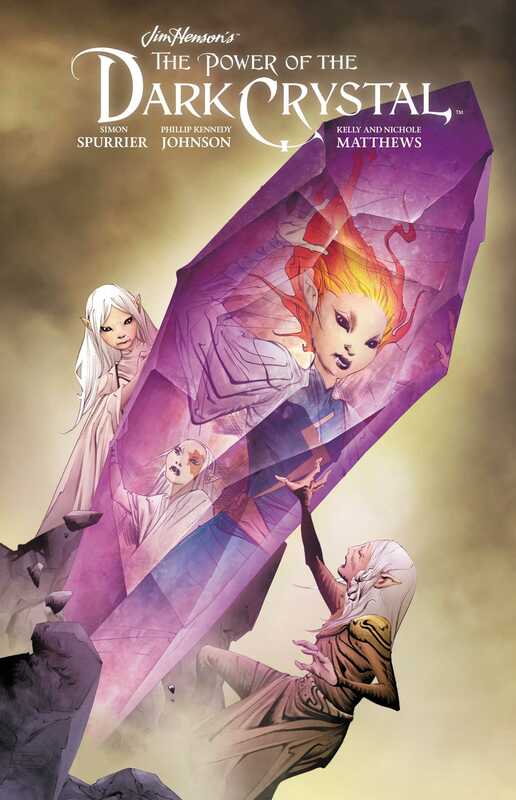 Written by Simon Spurrier (The Spire, X-Men Legacy) and Phillip Kennedy Johnson (Warlords of Appalachia) and lushly illustrated by Kelly and Nichole Matthews (Toil & Trouble), The Power of the Dark Crystal Volume 3 concludes Kensho and Thurma’s journey to the uncharted realm of Mithra.